The sheet metal can be offered with various colors by anodic treatment or baking varnish. With quality surface treatment, the product is ideal for saving your expenditure and at the same time, providing you the best to meet your need of metal components. 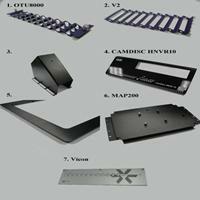 Besides, all of the sheet metal parts can avoid oxidization and available for lasting the life expands. It is commonly applied to car bodies, airplane wings, medical tables, roofs for buildings and many other things. Sheet metal of iron and other materials with high magnetic permeability, also known as laminated steel cores, has applications in transformers and electric machines. You can order our product for applications like communication equipment, accessories for vehicle or aircraft, and also available for computer accessories. All of the applications require precise metal parts to accomplish the function, and we are your first choice for sheet metal parts. We provide product to global market for various demands. Please feel free and contact us for details about our items.